New name – same personalised service! Stephen Austin Limited are a leading specialist in the printing and delivery of confidential and secure materials. Having acquired Document Technology Limited some years ago, our team have 20 years’ experience of successfully delivering election, registration and IER materials for Local Authorities across the UK. Given the nature of elections and the challenges involved, we work with each client individually to find the right solution for their needs. With an in-depth understanding of the complexities, we work collaboratively and flexibly. Your peace of mind is paramount. Our team continually update their knowledge of the legislative requirements and provide full auditability for all items through the production and delivery process. We apply innovative processes and technology to ensure accuracy and drive efficiency. In particular, as a result of the complex security protocols, we have developed a low cost, non-photocopiable secure mark for ballot papers to provide enhanced protection for your election documents. And we do it, within a state of the art factory, with 24-hour security all year round. Our Quality, Environmental and Anti-Bribery systems have all been externally assessed by UKAS accredited certification. 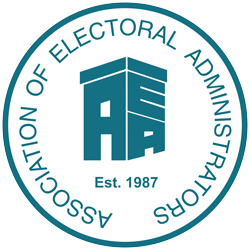 We are also active members of the Association of Electoral Administrators (AEA).